Topics: Insurance & Medicare, Diabetes Essentials, Professionals, and Abbott Global. 608 users visit the site each day, each viewing 2.60 pages. abbottdiabetescare.nl MyFreeStyle Diabetes Care | Suikerziekte bloedsuikerwaarden, ..
abtnsdmz2.abbott.com, and abtnsdmz1.abbott.com are its DNS Nameservers. 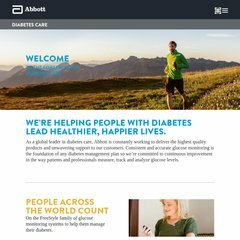 Abbottdiabetescare.com's server IP number is 130.36.62.28. PING (130.36.62.28) 56(84) bytes of data. The server is slower than 82% of measured websites, at 748 milliseconds. Also a time of 15.9 ms, is recorded in a ping test.